Keep your chicks warm. Use a draft shield or homemade cardboard ring 12 to 18 inches high to eliminate any drafts. The first few days the temperature should be between 90 and 95 degrees Fahrenheit under the brooder or heat lamps. Heat lamps should be 18 inches off the floor. Use 250 watt bulbs. Chicks should move freely about and not huddle together if the temperature is comfortable for them . Recommended for today's modern broiler chicks. Start restricting feed after three days old. A good commercial chick starter is recommended and we like a 21% protein ration. Restricting feed for the first month to 10 hours a day is usually helpful in slowing the broilers growth enough to prevent some of the problems associated with raising broilers (ascites and flip overs). Do not keep feed in front of them all the time! Take the feed out or let them run out of feed from about 6 at night to 7 in the morning. Avoid feeding broilers coarse feeds (oats). Free choice grit or medium sized gravel can be fed after they get started. Usually after May and into the heat of the summer the heat will restrict their feed intake enough that feed restriction is not needed. (Note! 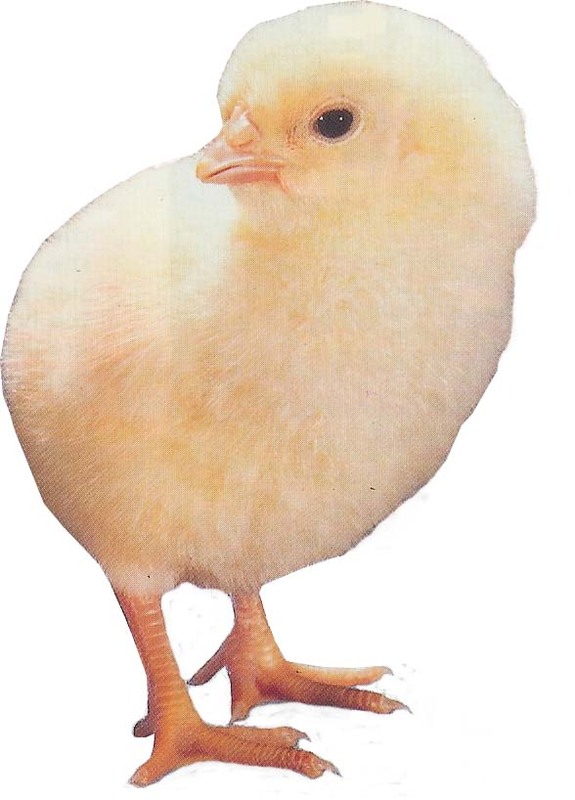 Egg type chicks do not need the close supervision that today's modern broilers need and are relatively easy to raise.) Fresh commercial feed is a must for the new babies. We've known old held over feed from a previous year to have had drastic results. Never let your chicks run out of water. You should have a one gallon waterer for each 50 chicks. Vitamins and electrolites are good for starting them. Use some dry mold free bedding to keep the birds dry and comfortable. Slick surfaces can and will cause leg problems. Covering litter for the first three days is recommended. The very best to cover litter with is an old bed sheet - your chicks can run around without slipping and sliding and can only eat the feed and not any of the litter. Baby chicks need very little floor space the first few days with the pen being made bigger as your chicks grow. They should end up with about 1 square foot per bird. Scatter feed around (even wasting a little) for the first couple of days. Crooked toes are sometimes caused by cold floors or lack of vitamins. Have good ventilation but avoid drafts. Fresh air is important along with trying to keep ammonia to a minimum. Stir litter as needed and spot clean if needed around waterers. or read our online tips.